Under Thapathali bridge, the once holy Bagmati is in a sorrowful state. Crows and kites swoop down on the refuse and because of the overpowering stench, few dare cross the river. The parks and temples along the banks are deserted. The oozing black sludge flows past shantytowns with outhouses perched over the water. It looks hopeless, but under moral pressure from activists who have started voluntarily cleaning the solid waste from sections of the river, the government is finally starting to act. Last year it signed a $137 million agreement with the Asian Development Bank (ADB) and the OPEC Fund to have the Bagmati cleaned up in four years. 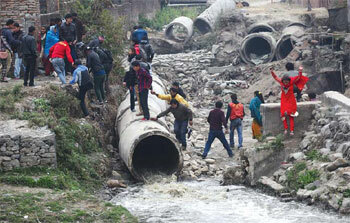 The Bagmati’s main problems are solid waste dumping and the raw sewage drains that empty into it. Four main systems need to be in place for the river and its tributaries to regain its past glory: sewage mains along the entire stretch of the river, treatment facilities, water reservoirs at the source of the river, and the completion of the much-delayed Melamchi Drinking Water Project. The laying down of 260km of sewage pipelines has already begun. The sewage mains from Gokarna to Guheswari and on to Min Bhawan are already in place. Rabindra Raya, an engineer at the High Powered Committee for Integrated Development of the Bagmati Civilisation, says his team will finish linking Sundarijal to Sundarighat by 2016. Secondary sewage lines from homes to the mains are also being constructed. However, with electricity and water-supply networks crisscrossing the track and controversies surrounding land encroachment, the project is moving ahead at a sluggish pace. The second part of the agreement between the government and ADB includes the construction of wastewater treatment facilities at five points (Gokarna, Guheswari, Sallaghari, Balkumari, Dhobighat) along the Bagmati. 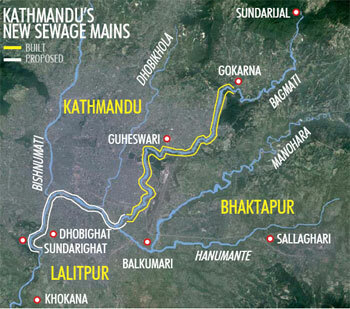 Raw sewage will be treated and released back into the Bagmati and the Kathmandu Valley Waste Water Management Project plans to generate energy from the sludge. PAST AND FUTURE: The Bagmati from the Thapathali bridge in the 1950s. Raw sewage flows into the Bagmati below Pashupati (above). Currently there is only one wastewater treatment facility at Guheswari. But since the time it was built in 2002, the capital’s population has grown 2.5 times and the Bagmati didn’t stand a chance. Power cuts affect the efficiency of treatment and will hamper the new plants as well. A final treatment plant will be built at Khokana with a capacity twice as much as all the other five combined. 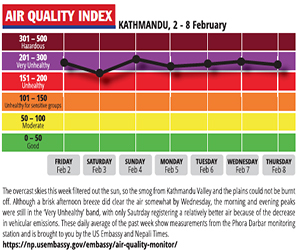 Kathmandu residents will be hoping that the Ministry of Urban Development shows better foresight and planning this time round than it did 30 years ago while building a similar plant on the Hanumante River, which shut down within a year of starting. The High Powered Committee also wants to construct a 19m dam at Dhap, near Sundarijal so that the reservoir can get recharged with monsoon rains as well as input from the Melamchi during the summer and release the water in the dry season. Another 70m dam at Nagmati, what Raya calls a dream project, would at full capacity allow a year-round release of water into the Bagmati. The ultimate success of the Bagmati plan depends on the completion of the Melamchi Drinking Water Project, which is slated for 2016. The water demand for the Valley is now 330 million litres per day and Melamchi will supply 170 million litres. There are also plans to pipe water from nearby Yangri and Larke rivers, which will deliver a further 340 million litres to the capital. But it is not only the Bagmati that needs attention. The river’s major tributaries (Bishnumati, Tukucha, Dhobikhola, Manohara, and Hanumante) are in an even sorrier state. 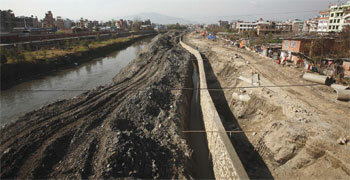 Laying down 130km of sewer pipes along all these tributaries would be needed if the Bagmati is to ever be cleansed.